I’m not an adventure junkie, but I have friends who are, and there is nothing sedate about our list of ways to get married for those seeking more than the conventional when it comes to ways to get hitched. 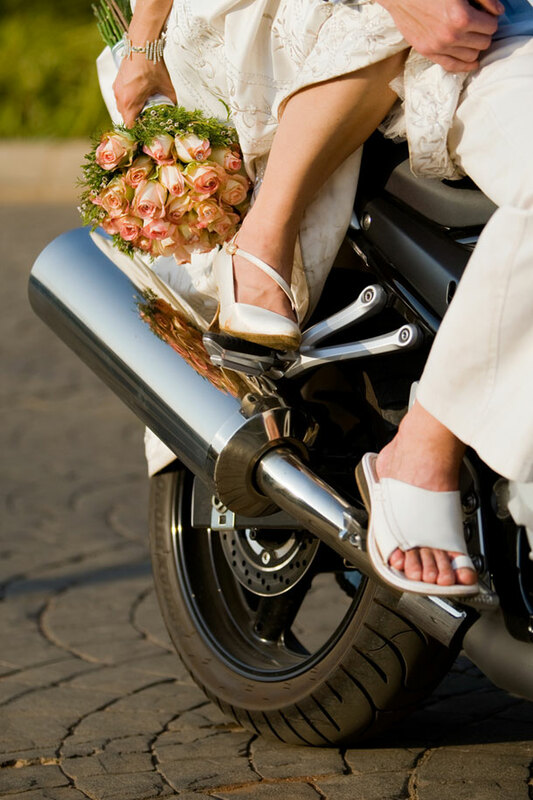 Arriving at, and leaving, the wedding on a Harley Davidson is something most brides would not even contemplate but if your man is a Harley fan, and the two of you spend more time on the road than not, then you’re pretty comfortable there anyway. Besides, think of the great vintage, black and white photos having it in the background could elicit. It doesn’t all have to be leather and lace either, there are some rather elegant ways in which to introduce said motorbike without losing any sophistication. Officially there are only three or so officially Harley Davidson licensed wedding items, so you might want to be a little imaginative if you’re doing this as your theme. Perhaps just stick to the Harley as your form of wedding transport. With some of the most beautiful and magnificent mountain ranges in the world – Table Mountain, the Drakensberg to name but a couple – getting married above the clouds is not unheard of. It depends on whether or not you’re hiking up there with your minister, or whether you intend escorting all of your guests there too? Whilst this has a distinctly Thai ring to it, it is also possible at home (for example, in the Waterberg). Not that the actual ceremony will happen on the back of an elephant, it’s more likely that the bride will arrive this way, whilst the ceremony takes place in a garden, elephants in the background, or in a little chapel nearby. Think of the photo opportunities – blue skies, bushveld, elephants and a typical African sunset.